which is the coexistence of silence and dynamism. in the theme of spiritually and materially prosperous and healthy living space. which is a branch of the profound knowledge Veda. equal to practice of yoga and Qigong. This is the total coordination system that we provide for realizing VAASTU. There, you may find yourself full of harmony by being in love with every environment. ― changing all the society for better environment with public natures. We will be very happy for you to use Kookan Healing, the VAASTU wisdom. 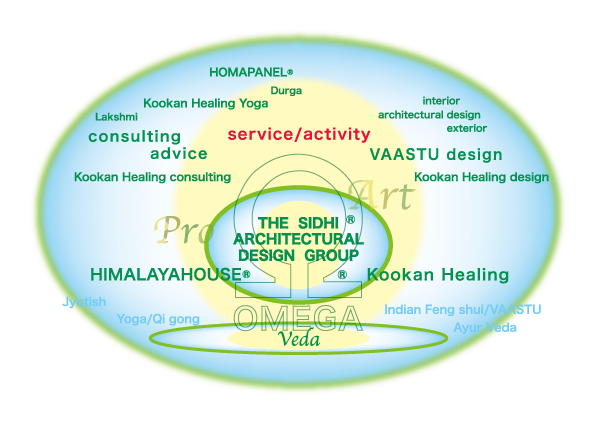 Now, please enjoy Kookan Healing information of HIMALAYAHOUSE. All the pictures（Kookan Healing designed pictures）on this website are made aiming at efficacy as yoga and Qigong come true. We think that looking at each picture will bring you good changes in your environment and consciousness.